Shankar murder case verdict was announced by Tirupur Abuse Prevention Special Court today on Dec 12th. The 11 persons are considered as the main accused including Shankar wife Kausalya's father Chinnasamy, mother Annalakshmi, Kausalya's uncles Pandithurai and Manikandan, Micheal, Selvakumar, Jagadhisan, Tamil Kalaivanan, Prasanna, M Manikandan and Dhanraj. Eight among them are reported to be convicted and judgment is awaited. Shankar aged 22, who belonged to Udulmalaipettai had marriage the girl Kausalya from Palani of other caste. Following it, Shankar was murdered on March 13th with sharp weapons in busy street at morning light. Police arrest Kausalya's father and filed case against him and others under Gundas act. The CCTV footage of the horrific 'honour killing' had gone viral on the TV and internet. His wife was also severely attacked and admitted in hospital. This shocked the whole state and the verdict for this case was keenly observed across the state. 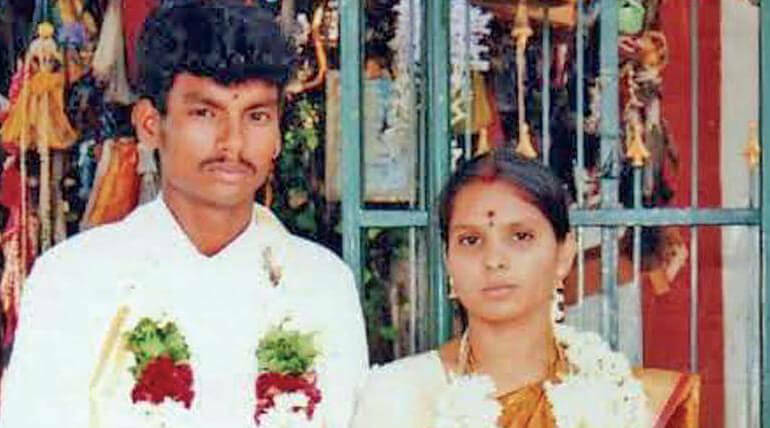 Shankar's wife rejected to speak her mind on this verdict. Her father Chinnasamy's faction argued to give them minimum sentences for their crime. The judgment has been announced. The 11th accused Manikandan is sentenced to jail for 5 years. The 8th accused Stephen Dhanraj gets double life term sentence in jail while other 6 main accused including Kausalya's father gets death sentence. Kausalya's mother Anna lakshmi, maternal uncle Pandithurai and Prasanna Kumar were released.